SUMMER $1,750.00 per week (7 nights) (June - September) Rentals are from Saturday to Saturday only. 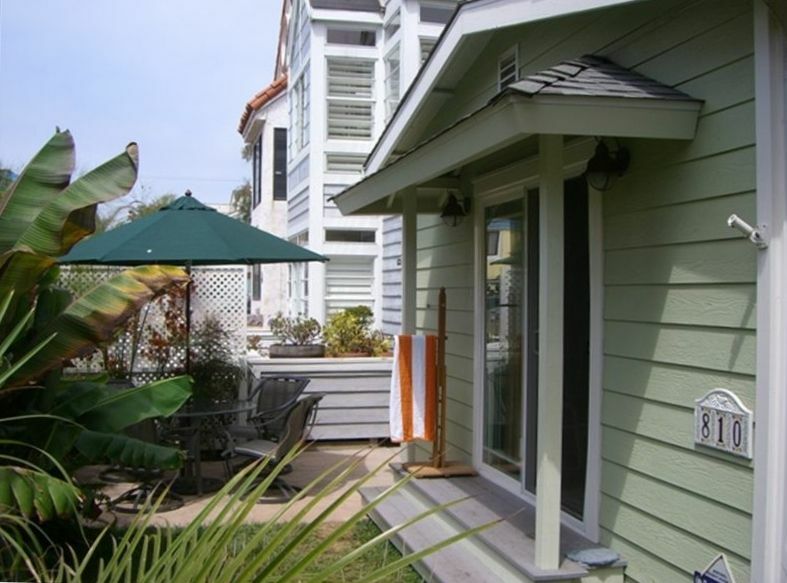 Our Beautiful Beach Cottage is a 2-bedroom, 2-bath home-away-from home it's steps to our beautiful Mission Bay and a few more steps to the Pacific Ocean. Featuring a private fenced yard very safe for toddlers. With a gas BBQ, and an out door eating area. It is within a 5-10 minute walk to a wide variety of restaurants and shops..
Our beautiful cottage is equipped with ceiling fans in each room for warmer days. You have off street parking for 1 vehicle up to a small mid size SUV. - A short drive to Sea World, San Diego Zoo, and other local attractions. It is a perfect getaway! - SUMMER $1,750.00 per week (7 nights) (June through September) Rentals are from Saturday to Saturday only. - A maximum of five individuals is allowed. - Check-in time is 3:30 pm and Check-out is 10:00 am. - A deposit of 25% of total reserved time, based on above rates, is required at time of reservation. - A $100.00 refundable security deposit is required. - $75.00 non-refundable cleaning fee. - Balance of payment is due 30 days prior to scheduled check-in date. - Credit card payment w/small fee (2.9%US, 4% Intl) via PayPal. - All Rentals subject to a 10.5% Tax, except for rentals of one mo or more. - Out-of-county payments require cashier's checks or international money orders. - Phone cards are needed for long-distance calls. Clean, tidy and close to beach activities. We stayed here in early August and agree with other reviewers that the place was adequately stocked with everything you need and had a great location. Rose was incredibly responsive and made it easy to book the place. The layout was a challenge for us, since we have a small child and you had to walk through the guest bedroom to get to the Master bedroom. It was nice having a bathtub and a shower. But, the flies! They were everywhere. Since the yard is mostly grass, it seems to be their preferred habitat. We couldn't enjoy the outside table because there were flies everywhere. And, since the place has no A/C, we had no choice but to leave the doors and windows open, thus letting the flies into the house. They were everywhere. Cute and cozy beach cottage steps to the Bay and beach! Great location! Excellent, excellent and more excellent! !